This laser cut wood kit is an HO scale model of a 28 ft. flat car. The model is based on a Harlan and Hollingsworth design from the 1860s. The kit includes side walls to allow conversion to a gondola and the model can be built either way. Both versions of the car very similar to designs used by many railroads of the time. 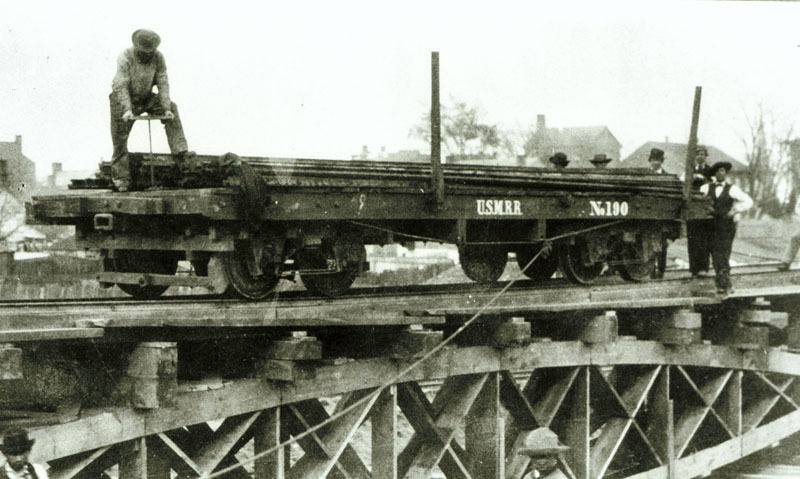 The black and white photos show examples in service with the USMRR. The kit does not include trucks, but we offer the approriate wood beam trucks for the car below. Connect with our Facebook page by clicking the f above. While there hit the "Like" button so we know you visited. Thanks. What is Alkem Scale Models? Alkem Scale Models is a small kit design and manufacturing company specializing in fine scale, highly-detailed and prototypically-basedkits and detail parts for model railroaders and other hobbyists. Our kits use computer aided design and usually include photoetched brass and or laser cut wood, acrylic and bristol board parts. They are designed and engineered for ease of assembly and scale accuracy. Our metal parts are etched to aerospace-medical quality by an ISO 9001 registered firm. We also have precision casting and electronic fabricators in our network of subcontractors. It is really a misnomer to call them craftsman kits, as most of the hard work of measuring and cutting is accurately done by the laser or etching process. Our kits do not include big piles of strip wood. Instead, almost all of our parts are cut to size, ready to be glued, sanded and finished. For example our coal dock kits use precision cut acrylic parts. All the builder has to do is glue the parts together, and in some caces, fill in seam lines.